Rabbi of Podhajee, Galicia; born at Lisko, Galicia, 1712; died in Berlin Oct. 28, 1744. His father was the author of "Pene Yehoshua'," novellæ on the Talmud, and Issachar Dob himself was a pupil of Hirsch, rabbi of Halberstadt. In 1741 he gave his approbation to the printing of Ḥoshen Mishpaṭ with its three commentaries. Three years later he was called to be "rosh yeshibah" of Metz, but while on his way thither he fell sick and died. Issachar Dob, though comparatively young at the time of his death, was known as an eminent Talmudic scholar. He wrote many responsa, some of which were published in the responsa collection "Ḳiryat Ḥannah" (§§ 41-44) and some in that of Ḥayyim Cohen Rapoport. His son Ẓebi Rosanes inserted others in his "Tesha' Shiṭṭot." 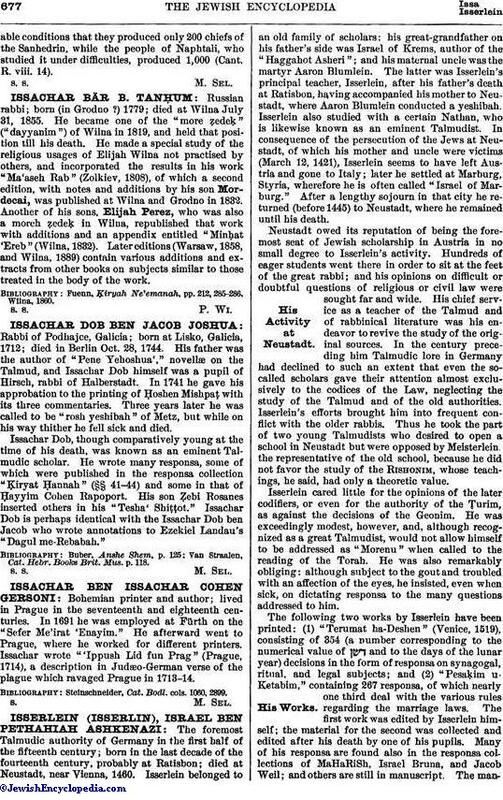 Issachar Dob is perhaps identical with the Issachar Dob ben Jacob who wrote annotations to Ezekiel Landau's "Dagul me-Rebabah." Van Straalen, Cat. Hebr. Books Brit. Mus. p. 118.